No, this post has nothing to do with the 2003 epic Tom Cruise movie that happens to be one of my all-time favorite flicks. 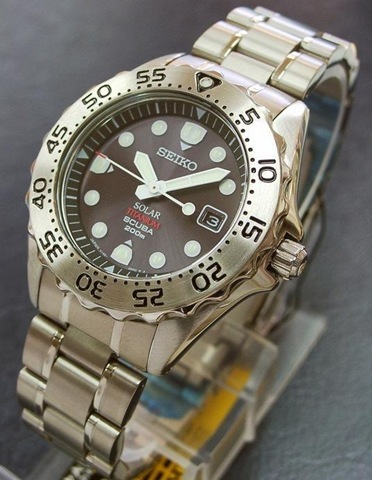  Rather, a little bird told me that Seiko has very recently indicated that their popular and lovable titanium “Samurai" divers are well on their way to total extinction. As much as I liked “The Last Samurai" film, I liked the timepieces from Seiko that happens to share the same nickname even better. 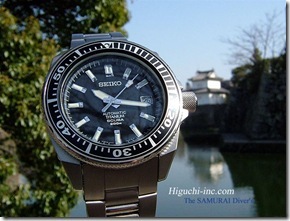 And by that, I mean the SBDA-series, Japan market Seiko dive watches affectionately known as the “Samurai". 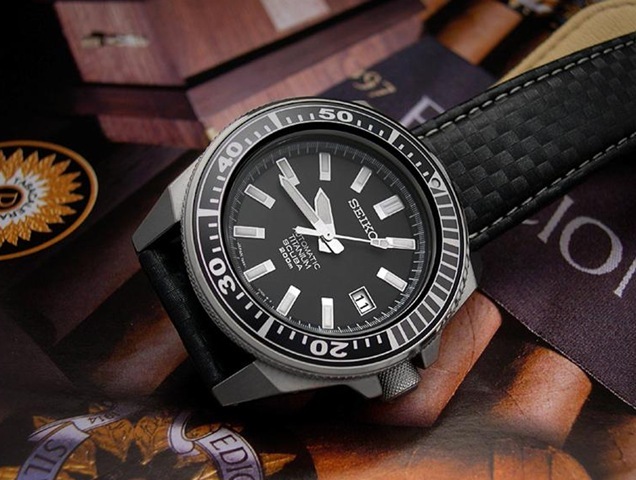 Just two or three months ago, there had been rumors on SCWF and perhaps other watch forums that these 7s25-powered, Prospex Scuba 200m divers were going to be phased out by Seiko. Several people cited that their favorite watch vendors based in Japan had given them the early heads up on this surprising piece of news. Surprising? Yes. Shocking? Hardly. I’ve always known that the Titanium Samurai models would be discontinued someday but I didn’t think it would be that soon! I immediately checked Seiko Japan’s website and true enough, the SBDA models were no longer in their product page. This is a confirmation that the Ti Samurais have been officially discontinued. 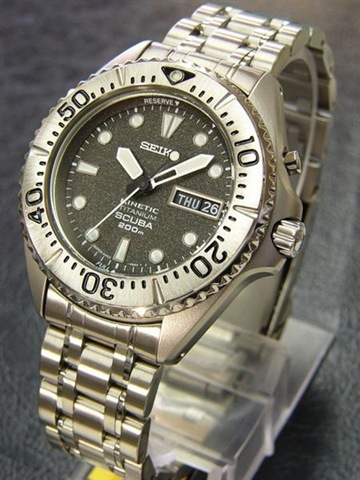 The SBDA-series divers first hit the limelight in the first quarter of 2004 from Higuchi’s sales website. Mr Katsuhisa Higuchi, the owner of the store released the first real-life photos of the black SBDA001 diver against a beautiful backdrop of an old, traditional Japanese castle where the feudal lords of ancient Japan would typically live. Above: Early photos of the SBDA001 artfully pictured against a Samurai "castle" background. Pics courtesy of Higuchi Inc. The new Prospex diver didn’t have a memorable nickname so Katsu-san sort of christened it as the “Samurai Diver", owing to his photographs of Seiko’s latest 7s25 diver. The nickname was very apt as the hour and minute hands also somewhat resemble a Samurai’s sword (so I’ve been told). 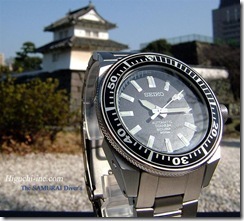 Seiko diver watch enthusiasts embraced the “Samurai Diver" nickname warmly and it had stuck ever since. Several watch forum members wasted no time in placing their orders for the SBDA001 divers while others (like me) preferred to adopt the “wait-and-see" attitude. 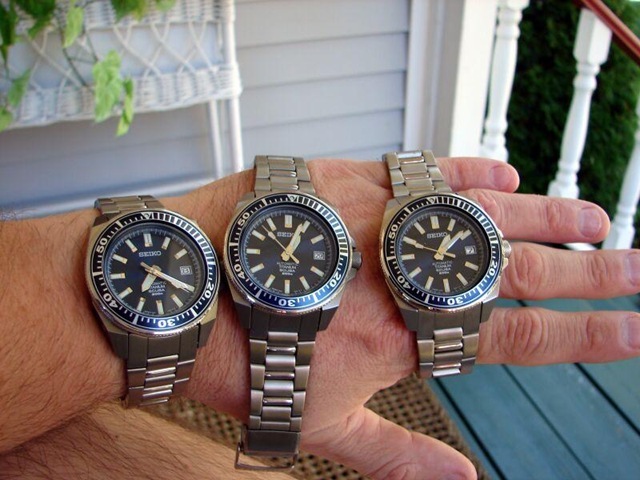 Priced initially at slightly around USD300 each, the Ti Samurais (sometimes also referred to as “Sammies") were not exactly your everyday, affordable Seiko diver like the Monster or the 7s26-002x models. Many patiently saved up to buy one of these radically designed, yet elegant Samurais. 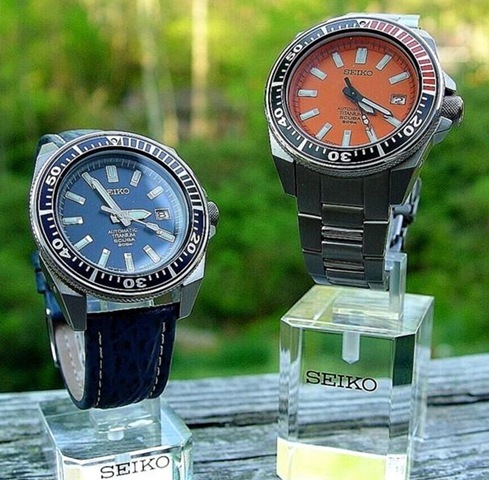 Seiko brought in three models for the “Samurai Diver" lineup – the black SBDA001, dark blue SBDA003 and an orange dial, SBDA005 on straight vent rubber strap. The SBDA005 came with only a rubber strap and later Higuchi Inc ingeniously offered an optional titanium bracelet at an additional cost. 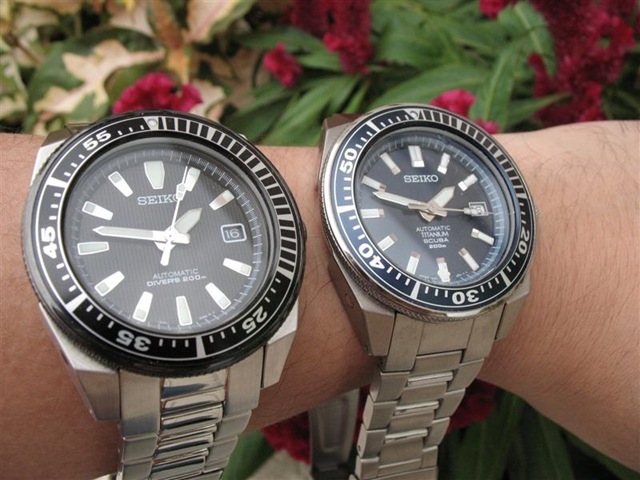 Where did the SBDA-series Ti Samurais fit in Seiko’s catalogue? 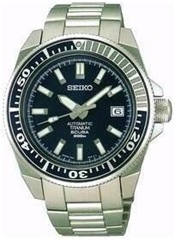 Well, my personal theory is that Seiko felt that they left a void in their entry-level automatic diver segment. The company had several divers like their evergreen mid-sized SBCM-series Perpetual Calendar divers, which were cheaper but these were quartz models. There was also the SBCB-series, V145 solar powered divers and the SCBZ005 Kinetic “Grey Ghost" model and none of them are mechanical. 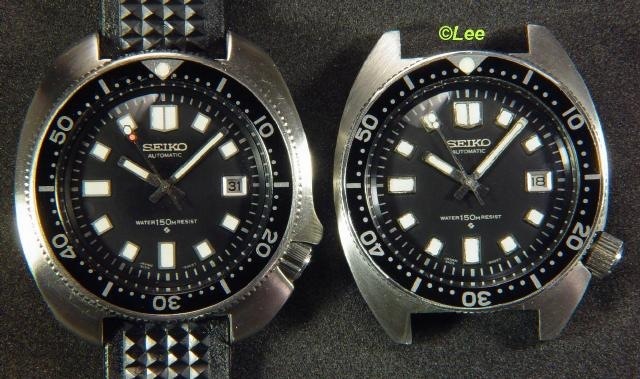 A step above the Ti Samurai divers would have been Seiko’s excellent SCVF001/003s divers based on their equally excellent 4s15 high beat, hacking and hand-winding caliber, but these were also sadly pulled off the market by the early 2000s. 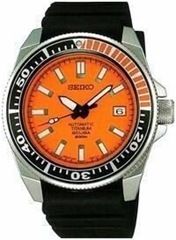 Oddly, Seiko still sells these non-mechanical Scuba 200m divers to this very day. (From left to right): SBCZ005 Kinetic, SBCB007 solar and SBCM023 Perpetual Calendar quartz. Pics from Watch Tanaka Japan. From the mechanical diver catalogue that left Seiko only with their flagship 8L35 equipped diver’s watch – the fascinating-but-expensive SBDX001 Marine Master Professional 300m. Unfortunately, not everyone could easily afford a high end USD1,600-plus watch like the the SBDX001. 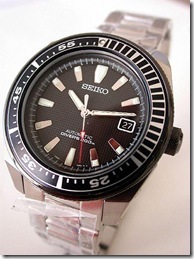 Therefore Seiko had virtually nothing to offer to their Japanese consumers for its entry level diver’s watch segment. Their SBDC-series, 6R15 Sumo divers also had another two years to pass before finally making their debut. 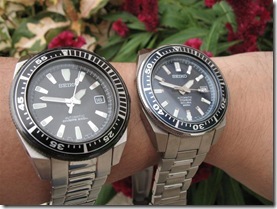 Seiko scores big time with the Ti Samurais! By early 2005, a year after the SBDA divers came out, I noticed that more and more fence sitters over at SCWF decided to take the plunge and join the elite “Ti Samurai Club". The SBDA wasn’t exactly a cheap watch (at least for me then) so I had to choose only one from the three. And so in March 2005 I finally satisfied my personal curiosity and ordered the dark blue SBDA003 from Higuchi. I selected the blue model as I felt the “de facto" black SBDA001 diver looked rather bland, for a USD300-plus diver’s watch. Several die hard collectors even bought all three colors to satiate their personal cravings for these highly attractive, wedge-shaped timepieces. Above: No serious Seiko diver’s watch enthusiast’s collection would be complete without having the entire Ti Samurai diver lineup (and in this case, the Sumo diver range too!). Image courtesy of "Sodapop". 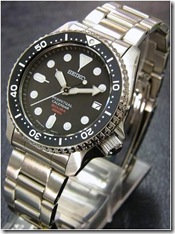 The Ti Samurai diver quickly gained a wide acceptance amongst Seiko enthusiasts despite its blocky, New Age design. Unlike the 6R15 Sumo diver, it wasn’t met with bad critiques even by the most cynical, vintage diver purist. Above: Three SBDA003s on a wrist (left) and a father-and-son wrist shot (right), Borrowed images. 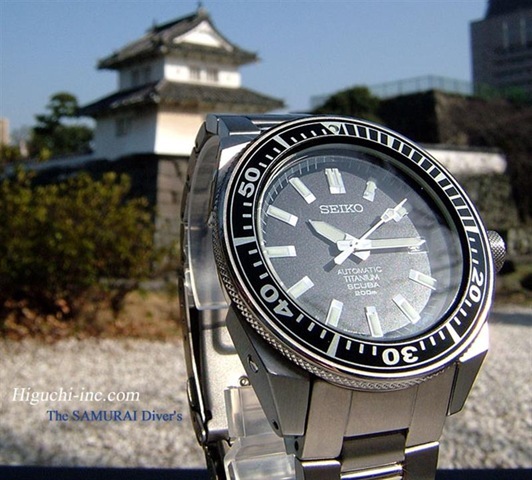 Seiko’s SBDA models appeared to be popular in the various watch forums and several months later, the company followed up a companion Samurai model in stainless steel form for non-Japan markets. Their stainless steel counterparts were quickly dubbed as the “S/S Samurais" and were priced cheaper than the Ti Samurais. For some reason Seiko made a few minor changes to the stainless steel models while retaining the basic case shape of the original Ti models. Only two variants were sold initially – the white SNM009K and the black dialed SNM011K with limited edition Samurais (nicknamed the “Ninja Samurais") following suit in late 2005. Anodized black finish on the crown and bezel plus black date display for the SNM011K. 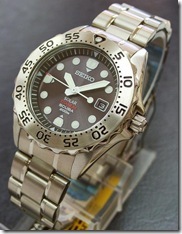 The use of Seiko’s 23-jewel, 7s35 caliber instead of the 7s25 caliber on the SBDA models. Above: The SNM011K (left) and SNM009K (right). Note the lack of crown guards. Pics from Wayne’s Watch World. Unlike their revered Ti Samurais, the SNM-series S/S Samurais were initially met with resistance by those who were already used to the original SBDA Samurais. The response was hardly surprising as many had expected the S/S Samurais to be exactly like their titanium cousins, except for the metal used. Critics were quick to highlight the strange wimpy, thin hands which defied the conventional wisdom that a diver’s watch should have prominent, thick hands coated with plenty of luminous material. The slim chronograph-like, red-tipped second hand didn’t exactly help either. Then there were the trivial, nitpicking issues of the absence of crown guards, the odd minute markings on the bezel and the poor contrast on the white dialed SNM009K. 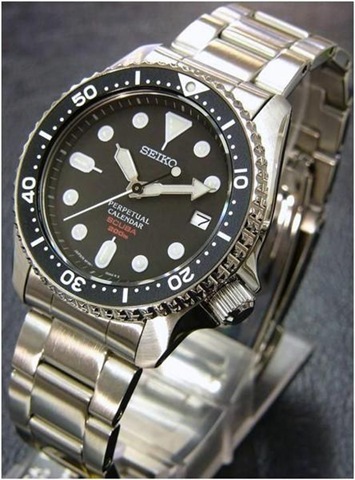 However, Seiko mitigated these "shortcomings" by pricing them about 50% less than the Japan market, Ti Samurais. How were the stainless steel Samurais were able to be priced about USD180 on the average when they first came out? Well, the most glaring fact is that stainless steel is inherently cheaper than titanium. The less-obvious fact is that the SNM-models were assembled in China where production costs are much cheaper than a fully Japan-assembled model. 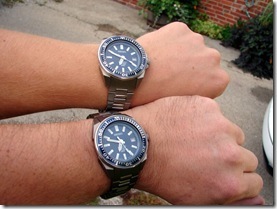 Top: Side-by-side comparison of the SNM011K and SBDA003 on my wrist. Why were the Ti Samurais discontinued? Good question, but only the insiders in Seiko can answer this perfectly. I do have some theories of my own though. Basically, like any other profit making corporation Seiko will replace their products from time to time as they see fit. Models that continue to generate high sales perpetually (like their evergreen SKX007K diver for example) will continue to be produced. Those that fare dismally in the market would eventually be pulled off the line. Simple as that. The Ti Samurai models have run their 4-year production course and Seiko is not interested in making them any longer. They are not selling as well as expected compared to their other models. The SBDA models were competing with their higher ranged, 6R15 divers and Seiko wants to push the latter. 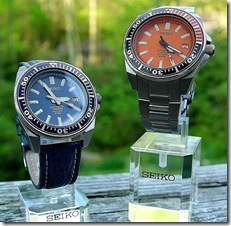 Seiko decided to replace the Ti Samurais with all-new models based on the same caliber. Seiko intends to discontinue their aging 7s-caliber Prospex diver range altogether, leaving their 6R15 "Sumo diver" models as their entry level ones. A totally new caliber will be introduced to replace the 7s-caliber, with a new range of divers lined up perhaps for next year. Where can I still find a Ti Samurai diver? 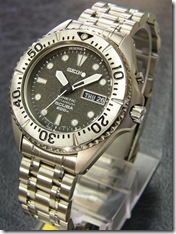 Although Seiko has officially phased out the SBDA-series diver, it doesn’t mean that you can’t find any new ones. Since the discontinuation is very recent, chances are that there are several Ti Samurais in circulation out there, either in brick-and-mortar stores in Asia or from online vendors. At the time of writing, SeiyaJapan has confirmed that he is unable to source any of the three models. Meanwhile, Higuchi Inc also reported being depleted of their black SBDA001 and orange SBDA005 models. However, Mr Higuchi informed me that he still has a few blue SBDA003s in his inventory. Reto Castellazzi, who runs the PMWF Sales Corner currently lists the Ti Samurais as being out of stock but he may be able to re-order from his suppliers. Chronograph.com doesn’t have any listed on its website either. 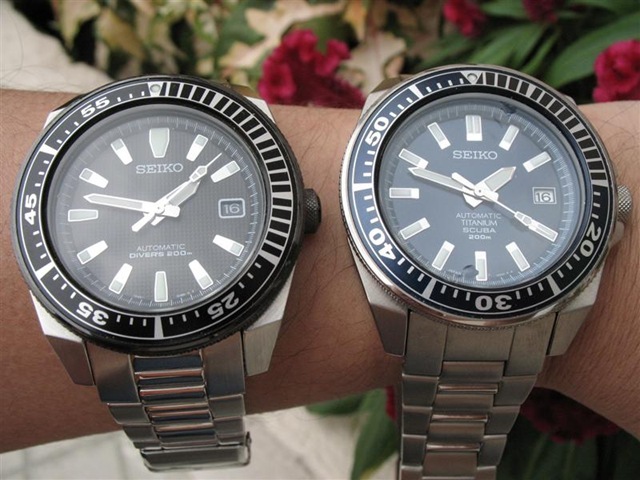 The Seiko5ers sales site advertises both the SBDA001 and SBDA003, probably in very limited quantities. Skywatches also has one SBDA003 listed here. You can also scout on eBay for sellers that may have one of the last of the Ti Samurais. If all else fails, you may have to settle for a gently used, pre-owned SBDA diver. Look out for "WTS" (Want To Sell) advertisements in the various watch sales forum, like the Seiko & Citizen Trading Post for example. Will the Ti Samurais become a classic someday? And now for the million-Yen question: Are these discontinued Samurais destined to become sought after classics twenty or thirty years from now? I think it’s possible. When the Seiko 6105-8000/8110 divers were once abundant and cheap in the early 1970s, they were considered just one of the many mainstream, workhorse Seiko dive watches. If you’re still procrastinating to buy the Ti Samurai, don’t! There’s no telling whether you can still find a brand new one by the end of 2008 and at a reasonable price. Another great addition to your excellent blog!! Great write up and nice photos too. Was expecting an unveiling of your own Orange Ti sammy LOL! Wonder whether the SS sammy will be discontinued as well in the near future. Did not realize that the SS sammies are already discontinued. I have noticed less and less exposure of the sammies over the past 12 months or so. Must be the advent of new models (Suno etc) that have replaced the sammies. So even when the sammies were discontinued and disappeared from sale on ebay it was not so noticeable. Too bad both my SS sammies are not used with ‘grail’ considerations so they have their fair share of scuffs and light scratches. Quite sad actually as i really like the distinctive design of both SS and Ti sammies. 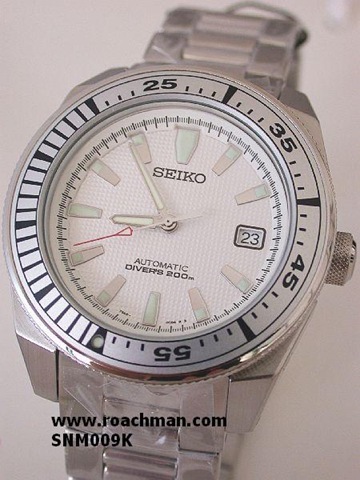 The problem with non-JDM Seikos is that many of them are not listed in Seiko’s websites. There’s no way to determine if models have been phased out. However, eBay auctions by the usual suspects can serve as some indication whether models are on their way out. There used to be a time when a search for “SNM011K” and “SNM009” will display many results. Since early this year, it looks like only Skywatches.com have them on eBay, at high asking prices. 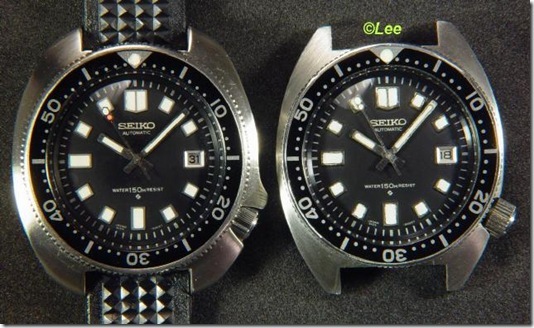 Quartzimodo please , as the seiko’s master, which will you buy..
Actually I bought both of them.  I got the SNM011K first and later the SBDA005 when it was already discontinued. – How you will use the watch. If you don’t mind a used orange Ti Samurai (SBDA005) and plan to wear it daily, the SBDA005 is the better choice. – Whether you prefer a brand new watch or a used one. Since you live in Shizuoka, I would recommend that you find a new SBDA005 in Japan, if possible. As for the SNM011K, please don’t buy in Japan – it’s very expensive in your country as the watch is imported from overseas. Do you know the thickness of hardlex crystal of seiko sawtooth? I spend about one week to finish all of your posts. LOL. Great article. It inspired me to buy my SBDA001 which I found near-new, 2nd hand on UK ebay for around GBP200 (US$300-ish). I have loved my bulletproof kinetic Seiko Divers for 10 years but wanted an auto and something more stylish… I can certainly vouch that the Ti- Samurai is a very well made, beautiful watch (which looks more like a high end one). It has a certain ‘je ne sais quoi’, very classy with a real character all of its own that people notice. Recommended! Congratulations on your lucky find. SBDA-series Ti Samurais are great value for the money, for the fit and finish. If it carried a Swiss brand instead of “Seiko”, this watch would have been priced at least 3x more. It took me sometime to decide to buy the SBDA003 (with deep glossy blue dial) and I managed to acquire probably the last orange SBDA005 from Higuchi’s store in late 2007. As with non DuraShield protected titanium Seikos, take care not to accidentally scratch your SBDA001. Titanium Seikos are unfortunately, scratch magnets. I enjoy browsing through your site. Suppose i am a WIS also, but more concerning the mechanics of these fabulous little “machines”. By the way “Q”, are you a trekkie also? Thanks for the comments. Actually I do own vintage Seiko timepieces; two 4006 Bell-Matics, a 6105-8009 diver, two 6309-704x divers, three 6139 chronographs, several 6138s, a few 6106s, one 7017 chrono, two 6119s and a few other calibers that I can’t remember offhand. I have a Seiko 5 titanium diver, 40th Anniversary. Diver 6105-8110, Navigator Timer 6117(NOS), and recently a orange Samurai Ti and black Samurai Ti. I sold a 6309 and lady 2205. After wearing the Samurai for the last two weeks, I’m stuck on the Samurais, super lightweight, feels light wearing a small watch when infact it is a big watch. The Samurai Ti is much lighter than the Ti diver 40th Anniversary, I wonder why?? After owning a NOS Seiko 5 Diver 40th Anniversary titanium, I decided to own a black Samurai Ti, comparing it other diver’s such as Rolex Submariner, IWC Aquatimer, Omega Seamaster, Doxa, and others, quality and price wise, the Seiko Samurai cost only a fraction of the others. That’s a fair question to ask. 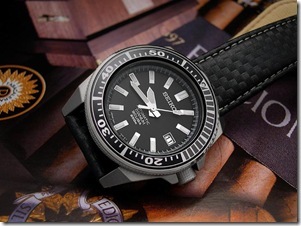 Why were the SBDA series Ti Samurai diver’s watches discontinued? 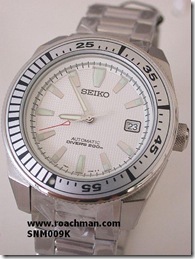 To make things as simple as possible, Seiko is a profit oriented company like any other manufacturer. You might like this particular watch (and so do many others), but it all boils down to the bottom line: sales and profits. Remember that the Ti Samurai models represent less than 0.1% of the total number of Seiko, Alba, Pulsar and Lorus watches that the company makes. The moment Seiko’s marketing division feels that sales of the Ti Samurai models start to decline, they’re already planning ahead to cease production. While Seiko appreciates your business, there are tens of millions of Seiko buyers on this planet who have never heard of the Ti Samurai, much less fancy them. Yes, I agree with you, Seiko is big Company worldwide, it cannot just satisfy the wants of only a handful of collectors. But in a way Samurais Ti dicontinue is good, it boost the price of pre-owned ones higher and higher. And making it rare to see one. I’m in Penang, Malaysia, so far I only met 2 guys on a Samurai Ti. I only start liking them a year ago, now I have to pay a high price for them, but I don’t mind. It is far better to own and wear than most of the Swiss diver’s and even though pre-owned it is still cheaper then Swiss diver’s, but much much better quality and very Accurate. I’m glad that you see my points to a tee. 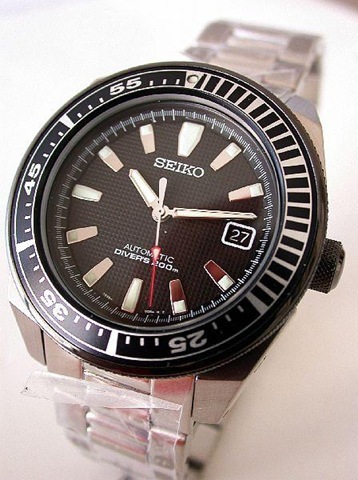 Seiko is not much different than any other large company that manufactures cameras and electronic items. For example, Canon will never re-release its legendary A-1 film SLR camera nor will Nikon remake its famous Nikon FE SLR from the late 1970s for the same reason that Sony will not make a commemorative model of its very first Walkman tape player that revolutionized music listening on the go. Since you live in Penang, you might know that the Orient distributor for Malaysia is located in Penang. I noticed that watch stores in Georgetown tend to carry more Orient models than elsewhere. Although Seiko Japan has over 50% share in the Orient Watch Company, the distributors for Seiko and Orient brands are different companies. 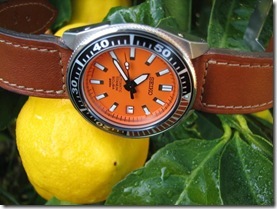 Orient makes pretty good watches too but generally there are less Orient fans than there are Seiko enthusiasts. When it comes to Swiss branded watches, in some cases (depending on the brand) you’re paying a lot more than what the watches are really worth. TAG Heuer is one that I would never buy as not only its watches are way overpriced; TAG doesn’t even make its own watches but outsources to one of the many smaller watchmaking companies in Switzerland. Hi, I have seen a lot of Orient watches, some with nice power reserve indicators, and some nice looking diver’s too, but somehow, Orients cannot be comparable to Seikos. It’s like comparing Mazda to Toyotas. The Grand Seiko, or latest spring drive, is like buying a Lexus. So no comparision. But to be fair, value for money, Orient can do also. But for me, it is still Seiko. 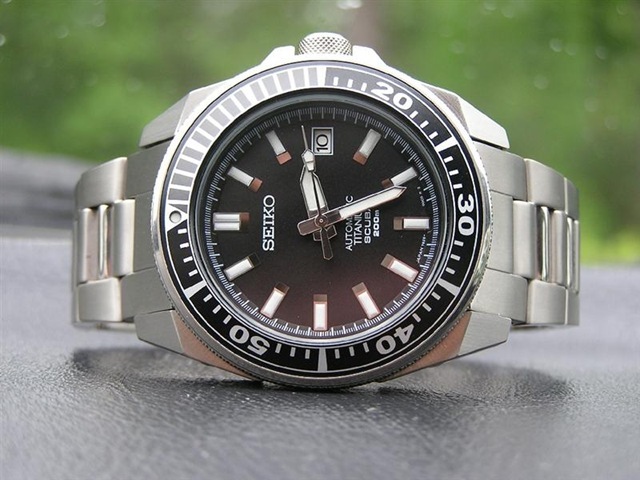 A friend bought a Seiko Marine master titanium, spring drive SBDB001 using my Paypal account, and I have to opportunity of wearing it for a few days. It was US$4700- After comparing it to my Samurai Ti, the Samurai Ti is still value for money. 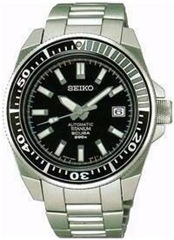 I don’t know about resale, buying a $4700 Seiko, when you want to sell it fast, sure will lose a lot of $$$. Hi, I just bought one showroom display orange samurai and one NOS black samurai Ti. Price is slightly higher, but condition is 99%. Very satisfied. 2 orange Ti and 1 black Ti for friends, and 1 orange and 1 NOS black for myself. Altogether amongst us 5 Samurai’s Ti . Just to share info with all you Samurai owners. There is a special square piece, eraser rubber shaped like, polishing rubber meant for polishing titanium or stainless Steel, a friend who is a watch trader gave me a small piece, wow! I could polish the part on the bracelet where there was scratches on the buckle, it look real damn new !! We can’t get them them here. Been told it’s bought at hardware stores in Hongkong. So if any Sammie’s friends in HKG, can source around it’ll be good.